Oto Rimele started to assert himself in the Slovene fine arts in the beginning of the 1990s, a time of strong postmodern endea­vours that tried to suppress everything that did not meet their principles, a statement particularly true in Slovenia. Perhaps this situation, in addition to Rimele’s personal depth and the traits of his character, contributed to the fact that, after leaving the academy, his work simultaneously took several directions. Since his first paintings, which already showed a tendency towards objectification, Rimele has accurately expressed in words his theoretical starting points, which have been published several times as individual essays or as statements in various interviews.1 His thoughts show not only clear epistemological bases, but also a consistency carried over into practice, something rarely seen in other artists. After twenty years of work, we can observe how his initial ideas have been upgraded and visualized into what Rimele has defined as “paintings of the consciousness of the mind”. 1 As the author builds his theory in a logical way and often returns to it in slightly changed formulations, we have not cited the sources when we quote or summarize his ideas, for this would make the text full of notes. His printed statements and conversations are gathered in the bibliography, while unpublished ideas and suppositions made during the preparation of different expositions are available in the author’s archives. Rimele was already thinking about matter and spirit with discursive philosophical seriousness as a postgraduate student two decades ago at the Academy of Fine Arts, a point which seems to have been a symbolic prophetic announcement. This topic is the origin of all cosmogonies which guided and still guide human deeds and ideas at all times and in all parts of the world, including the Greco-Roman and the Judeo-Christian cosmogonies on which our civilisation is based. When at the beginning the Creator created the sky and the earth, in whatever form he did this, he created a basic junction of the two elements at their very disjunction. This disjunction defines the Platonic or the Neo-Platonic unison of the corporeal and the spiritual, which can never be attained, as well as the endeavours of Christian mystics to achieve the spiritual by denying the material. At that time, Rimele was creating distin­ctively material paintings which resembled three-dimensional independent objects, and paid special attention to thick applications of colour. He prepared them himself from orga­nic substance through a ritualistic procedure. 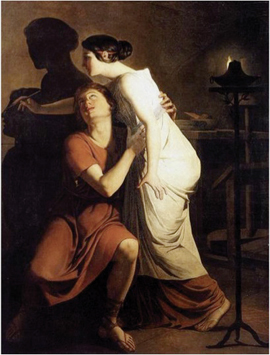 This work demanded skills of a craftsman, such as Plato’s carpenter, and knowledge of chemistry on the compatibility of certain elements, and directed Rimele’s idea towards two solutions of the original question. One solution was directed towards the alchemic search of pre-origin, of the primal matter (prima materia), which included the spirit, and the other towards the convictions of theosophers, such as Rudolf Steiner, Uspensky or Madame Blavatsky, which were based on one’s reco­gnition and acceptance of the unity of matter and spirit. The eminent, eternal existential and philosophical question is of great importance for an artist, particularly a painter who decides to renounce all imitative, narrative, descriptive and other allusive and illusive factors that could direct perception away from the image as an independent entity. Among the different image-forming elements that enter from the broader outer space of the field into its inner space, only those pertaining to pure fine arts allow pain­tings to become “objects of the eye turned inward”, as the author wrote in 1993, at the occasion of the exposition entitled World and Consciousness in the Ecstasy of Sublimation, Limitation and Autonomization, referring to Plotinus’s gnostic hypothesis: “He will be that which he sees”. Rimele’s works exhibited at that time point, in an auto-referential manner, to the traces of the creative process, to the materiality of the pigments used, to the format, which means only to the material presence of the painting itself, freed from any resemblance: the image without similarity. Nothing about them points to a spatial dimension or alludes to anything with a form, anthropomorphic, biomorphic, or otherwise. Everything happens in the complete flatness of two dimensions; the paintings are like abstract bodiless organisms which reflect the creative energy invested in them to those who feel and accept its frequency. These images cannot be admired in the usual way: they allow only co-experience, encouraging spectators to dive into themselves, into their own souls. Rimele’s early works of that time approached the ideal of Byzantine and Orthodox icons, from their victory over iconoclasm to Malevič’s iconoclasm over them. Namely, the destiny of images in Christianity in practice most eloquently illustrates the dialectic relationship between matter and spirit. At the very beginning of the ten Commandments in Exodus it is written: “You shall not make for yourself a carved image, or any likeness of anything that is in heaven above, or that is in the earth beneath, or that is in the water under the earth.” (Exodus 20:4). Christianity at first adopted the Jewish prohibition, in the conviction that images mislead people into polytheistic idolatry, into the worship of visible and palpable objects, leading them to reject the free and invisible God from Sinai. This is why the Byzantine rulers prevented creation of images. However, images also had their defenders, who used the highest allegory in their defence: the sky lowered down to the earth when God’s word became an image. It assumed a human face, in which all believers can unite to discover the invisible God. 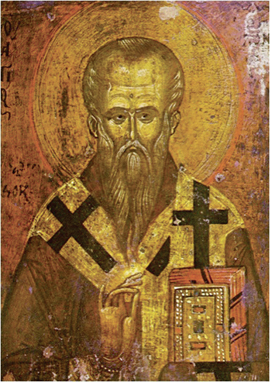 As Saint Basil the Great says, the Son comes from the Father; he is his image, the perpetual reflection of his essence. Just as the word is the image of the thought of the heart, so the Son (Logos) is the image of the Father. 2 Jean Damascène, Le visage de l’invisible (ed. Anne-Lise Darras-Worms, Marie-Hélène Congourdeau), Paris 1994. For the destiny of Christian iconography and western art in particular, this was a fatal turn towards the belief that for the understanding of the highest truths, it is not only the preached or written word that is necessary. Its spirit can also be imprinted with equal importance through coloured material. Therefore, in the first periods of Christianity it seemed that for the reco­gnition of the divine and for striving towards the spiritual it was not important whether the pain­ting represented Christ or only his symbol – a fish or a cross (figs. 1, 2, 3). We are not saying that Rimele had to follow the example of the creation of a Christian image in order to bring plausible spiritual energy to the dimensions of the painting matter. Far from that, he wrote the following: “I understand God as a group projection, as an identification with the ideal and as man’s yearning for eternity: when man wants God, what he really wants is himself.” This statement can be verified in his work: the Christian monotheism demands theo-centralism in all domains, which is why the central scenes in iconography, such as Christ’s face, crucifixion, Mary with child etc., are depicted in a central position, for only thus can the subject see and control everybody, demand attention and worship, and perform miracles. This position, which also originates in Christian iconography, is still seen in classical as well as abstract modern painting, which was the starting point for Rimele. Yet Rimele’s frontal part of the canvas soon became more and more empty, the sub-frames became thicker and the essential movement was displaced towards their edges. The author himself pointed to this by directing the look to the painted edges with lines on the frontal surface. He did this so intensively that the frontal surface finally became completely neutralized and all the essential movement now occurs only at its edges, which have radiated light through the last decade. 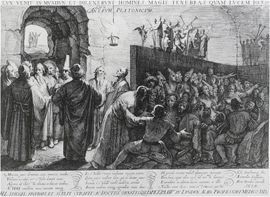 This practice, which can be traced back to Rimele’s artistic beginnings, is explained by the author as his own principle, for he can more easily identify with the de-centralized and marginal world than with the hieratic world, which is of course contrary to the Christian complete focus on God. There have of course also been many other models and ways for achieving spiritual impression in the history of art, such as the theory of the sublime, creation in ecstatic states of mind, therapeutic practice of people with a psychotic disorder, expressionist empathy, etc. Yet Rimele is aware, in his endeavours to establish the broadest communication (in his subjective, hermetic manner, excluding all narration), that the latter is possible only through archetypes. As a rule, the more common these are, the more universal they become. Among the ideologies which have established the most archetypes, Christianity again prevails in Western civilisation. When Christianity had mastered all the mechanisms of persuading and subjecting believers, including by the means of holy images, it started to spread the use of purple, of golden leaves and the most precious ultramarine alongside the ordinary earth pigments. The choice and popularity of these colours was not solely due to their imitative functions; on the contrary, they were intended to exhibit the power of the Church, of the rulers who fought with Church over secular as well as spiritual power, and of all other wealthy people who ordered artistic works. Their symbolism was explained by holy documents, including the Bible, the eternal truths of which it was not possible to contradict. The light which the lustre of these colours reflects has an even more generally understood archetypical meaning. When the biblical God created the world, the world was enwrapped in darkness. Therefore he said:” ‘Let there be light,’ and there was light. And God saw that the light was good. And God separated the light from the darkness” (Genesis 1:3-4). God did not create the light, but called it into existence with a word and thus started to arrange the world. When the mysterious uncreated light appears in the Bible, this in an omen in the world perceived by the senses, a sign of God’s “migh­tiness” or “glory”. 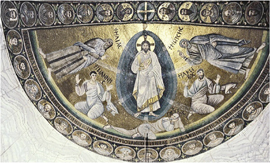 Such ontological change of the essence of the matter, which is crucial for the correct understanding of the ultimate mea­ning of all created beings, can be found in the following occurrence: six days after his death, Jesus was transfigured on the mountain of Tabor in front of some disciples. “And he was transfigured before them, and his face shone like the sun, and his clothes became white as light” (Matthew 17:2) (fig. 4). The aforementioned presumption about archetypes that the biblical text established in people’s consciousness, found also in parables and fine arts ima­ges, is well presented by the following: the disciples were on their way to Emmaus. “/…/Jesus himself drew near and went with them. But their eyes were kept from recogni­zing him. /…/ When he was at table with them, he took the bread and blessed and broke it and gave it to them. And their eyes were opened, and they recognized him. And he vanished from their sight” (Luke 24:15-31). 3 Victor I. Stoichita, Apariciones, sombras y el límite de lo visible, in: La sombra, Museo Thyssen-Bornemisza, Fundación Caja, Madrid 2009 [exhib. 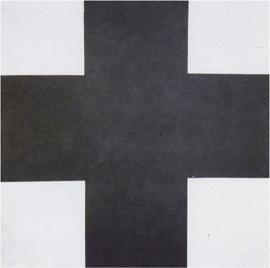 catalogue], pp. 30–37. 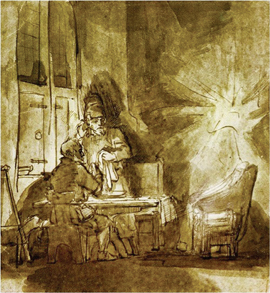 The relationship between Christ’s figure and its physical absence, and at the same time his spiritual presence as seen in both painting and sketch, which we have presented as a deve­lopmental sequence of the miraculous event itself despite the time difference, also represents Rembrandt’s creative thought. At first, the dark and thick applications on the frontal surface of the canvas emphasize the activity at the edges reflecting light from the back side, invisible to the observer, towards the wall. 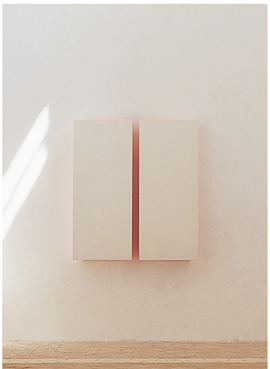 Gradually, the paintings become brighter on the frontal side; it seems as if they float in front of the white wall, and the light of the back side reflects so intensively that its lustre penetrates the materiality of the paintings’ frontal layer like an aura and dematerializes the wall itself. The concrete presence of the painting-object dis­appears and is replaced by another, an abstract pre­sence of its reflection, which symbo­lises the spirituality of material absence. Sciences such as astronomy and physics can nowadays explain in detail the phenomenon of natural light, and by the help of these fin­dings it is possible to create various artificial forms of light. That is why we are unable to understand the importance of the Sun in the past, when people woke up in fear that it might not rise in the morning, which would have meant death. Or how the shock of lighting ripping the stormy sky led them to pray out of a conviction that the gods were sending them the destructive signs of their anger. They experienced a similar terror when there was a solar or lunar eclipse. The solar eclipse was accompanied by a cold wind, which reminded them that a loss of vision meant being surrounded by eternal cold. And as it is possible to see only when there is light, they ascribed it positive characteristics, such as goodness, warmth, and the ability to shine through everything that can conquer the chaos of darkness. That is why the Sun was an allegory of the highest divinity and its characteristics were attributed to the most important gods of all religions all over the world. And as nobody can look into the Sun without going blind, the highest divinities in all civilisations were protected by the blin­ding glare. Whoever wanted to approach the light or appropriate it for themselves, like Prometheus, Icarus or Elymas the “magician” (Acts 13:8), was most severely punished. The function of light has long been tameable and made practical; the sundial divided the day, determined a moment, testified of its passing by and foretold the future. The Stonehenge menhirs served as a calendar which measured the course of the year and dictated occupations according to its periods, in addition to determining the consecrated days and holidays. Windows allowed light to pass into closed spaces and thus enabled people to live within. The more and more sophisticated forms of illumination enlivened spaces at night, enabling the light to overcome more and more effectively its opposite, the darkness. This strengthened the philosophical and religious symbolic meaning of light as the idea of good, as something pertaining to God. This is why it had a more and more important role in the visions of the mystics, such as Pseudo-Dionysius the Areopagite, Te­re­sa of Avila and John of the Cross, all of whom me­ditated on the ascension of the soul towards the Holiest and the Brightest. 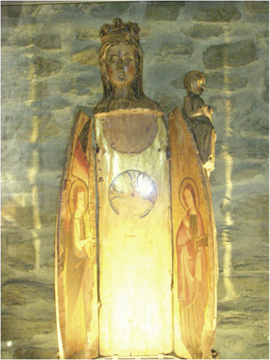 In the iconography of Christian liturgical architecture and its ornaments, light played a crucial role in the dematerialisation of the concrete buil­ding into a spi­ritual allegory of a holy state: in the ancient Christian, Byzantine and Romanesque churches, it was reflected in golden mosaics; in the diaphanous Gothic cathedral it was reflected in the coloured sun rays which shone through the coloured windows and the trembling candlelight which gli­ttered on the royal gold and purple of liturgical equipment. The interiors of a Baroque church, with their softly undulating walls, dramatic withdrawals, roundnesses, hollows, spirals, breaks and golden altars, all of which capture and reflect sunlight shining through the large windows, have become works of art themselves. The chapels and altars were deco­rated with the vast dynamic canvases of Caravaggio, Rubens and others, throbbing in powerful contrasts of light and darkness. Its scenery, resembling that of the theatre, was complemented by ecstatically dynamic statues of saints’ figures of red ochre and golden draperies, heavy yet softly flutte­ring. With chiaroscuro, the light and its opposite, the darkness, became an allegory of good and evil as well as a challenge, not only in terms of content but also in artistic terms, which were even more emphasized in the Romantic period. 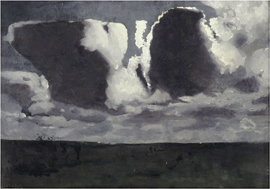 It achieved its climax with the Plenerists’ representation of hazy, dispelled climate phenomena, as well as with other precedents of Impressionism and the Impressionists themselves. All the artistic colouristic movements since have believed their most important mission to be the search for ways of dematerializing coloured light. After World War II, the emphasis of purely natural or artificial light, which fades away from the canvas surface, reached its climax. By that point the art of painting, after the period of Impressionism, had successfully freed itself from the illusion of the third spatial dimension that, according to the laws of perspective from the Renaissance, expanded the two-dimensional canvas to an apparent depth; in high modernism, Ad Reinhardt, Barnett Newman and Mark Rothko finally reversed the issue; they endeavoured to re-spatialize a flat painting, this time by the illusion of the abstract space in front of the canvas. Particularly in Rothko’s work, the application of colour va­nishes and flows towards the spectator in the form of a veil of light. The impression of di­spersed colourful hazes is even more intensive and alive when several large canvases are placed close together in a room. 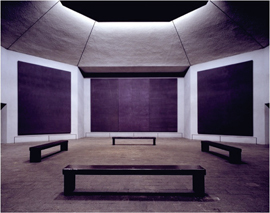 That is why Rothko dealt also with installations, through which he wanted to achieve the universal archetypal religious experience. This experience was supposed to enable man to find his inner balance between the depressiveness of darkness and the mysteriousness of light. In a chapel in Texas he tried to create a holy place intended for all religions, not belonging to anyone in particular (fig. 7). It became the centre of international cultural, religious and philosophical meetings, at the same time being a place of intimate prayer for believers of any religion. The persuasiveness of Rothko’s liberation of colour, which becomes alive in the room, undoubtedly contributed to the fact that many artists started to create with colour light itself in the 1960s and 70s. This was a time when the lowering costs of new technologies such as fluo­rescent illumination already enabled the lighting of everyday living and working places, amusement parks and even more banal locations. Many creators endeavoured to find aesthetic dimensions in such surroundings and to re-create them in the more consecrated gallery halls. 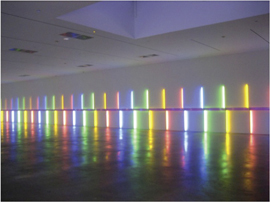 Dan Flavin from the USA, for example, created light installations using neon bulbs (fig. 8), and Dušan Tršar from Slovenia created Light Objects by using neon illumination and plastics. Since then, many artists have dealt with this issue. 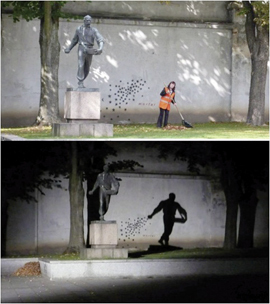 With light sources in various locations, they create optical illusions in which the observer or the visitor loses all concrete reference points and orientation coordinates. Yet it has become more and more demanding to achieve effects which cause disorientation of the observer’s perception and gravitation, for our senses have become used to different impressions caused by the stimulants and simulacra of modern virtual worlds. The transformation, strengthening and fading of colour intensities should be minimal, as they need to trick human senses and conceal the reality of the world from them by taking into consideration the response of the brain to such changes. The projects depend on specially created techno­logy and vast spatial dimensions. 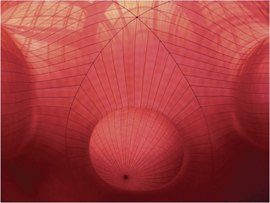 That is why the most convincing work today is that of authors such as Anish Kapoor and James Turrell, who became enough famous to be able to provide financial means for their further work (figs. 9, 10) on thrilling and famous installations. 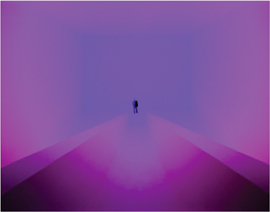 In 2012, Turrell plans to open an installation inside the gigantic crater of an extinct volcano (Roden Crater) in Arizona, a display on which he has been working for several decades. Rimele’s latest installations resemble the subtle character of the works of the aforementioned artists; the frontal part of the painting-object is still present, yet it is in a subordinate position as regards meaning. It could be said that it is sacrificed to the colour light which is reflected by its back side (fig. 11). Light can be established only in the presence of its polar contrast, darkness, and it is this darkness that creates the next multi-meaningful archetype, the shadow. Rimele describes his work with the following words: “The pain­tings–objects are constructed in such a way as to generate colour: they are objects of the generation of colour and they are catchers of light. Thus they become creators of shadows.” Although shadows are optical phenomena which can be easily explained, they have always been connected to psychical experience; they are often perceived with anxiety and fear, sometimes with amusement, but they are always elusive and intangible. The kingdom of the dead is the kingdom of shadows, which is why many interdictions and persecutions as well as superstitions refer to it. The most important person is usually the person in the shadow, and sometimes it is the shadow of an object which confirms that the object is real. 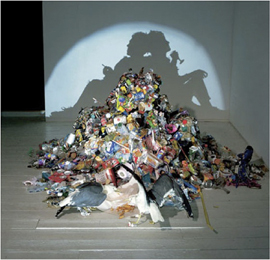 The shadow is the person’s double, the allegory of the soul at the threshold of the invisible and the unknown. It shrinks and stretches, it moves and deforms, it appears and disa­p­pears like a “hole” in normal time and space in which the real, tangible forms mingle with their own outlines and shadows4 (fig. 12). 4 Ernst H. Gombrich, Shadows. The depiction of cast shadows in Western art, National Gallery, London 1995, p. 17. 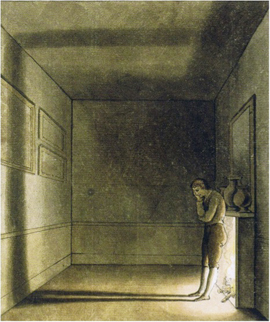 These characteristics are mentioned also in Pliny’s tale about the contours of the shadow, which testifies of the absence of the body, while the presence of its projection remains: “Everybody says that the art of painting began by drawing an outline of a person’s shadow; that is what the primary art of painting was supposed to be like. In the next phase of development, only a limited number of colours were used and that kind of painting was called ’monochrome’/…/ The potter Butades of Sicyon invented the art of making portraits by using clay. He discovered this with the help of his daughter, who fell in love with a young man. Because he was sent abroad, she drew the outline of his face upon a wall. Her father impressed this outline into clay and created an image …”5 (fig. 13). The beginnings of the art of painting and sculpture are thus not connec­ted with the fine arts’ reproduction of the corporality of some figure or object, but with the flat outline of a projected profile, such as can be seen in Egyptian art and Ancient Greek painted vases. Only then followed the mime­tic imitation of the third dimension, which was canonized already in antiquity and then again from the Renaissance on, until its abandonment by modernism. 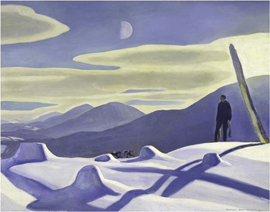 After finishing his studies, Rimele did a lot of theoretical thinking about non-mimetic, flat, monochromatic images and has also been creating them in practice. 5 Pliny, Natural history, XXXV, 15, 151. The second, even more important myth, according to which shadows are crucial for the perception of what really exists, is Plato’s allegory of the cave, in which people have been chained since childhood so that they cannot move and can only look forwards at a wall. Shadows are cast upon the wall as if upon a screen because of the light of the fire behind them. These shadows come from various stone and wooden figures of people, animals and different objects, which are carried by pu­p­peteers who are hidden behind another wall behind the chained prisoners. When these spectators talk about the shadows, which are all they can see and recognize, they are convinced that they are talking about real things. If someone were to show them the figures which were casting these shadows, they would believe the shadows to be more true than the figures. However, the prisoners would not be able to look into the light of the fire cas­ting the shadows, but would divert their eyes from it, in the same way we cannot look directly into the sun in this world. If a chained person were to be brought outside into the sunlight, that person’s eyes would be full of brilliance and unable to recognize any of the objects which are real to us, until they became used to the light. When the prisoner returned to the cave and tried to explain to the fellow prisoners that what they see is only a dim reflection of reality, they would not believe what they heard. The enlightened individual would have trouble showing them the way towards light6 (fig. 14). 6 Plato, The Republic, 7, 514a–516d. Let us leave aside the numerous philosophical and artistic implications Plato’s cave has had – from a simple children’s game of creating silhouettes of animals and other figures on the wall, to the theatre of shadows, public performances featuring phantasmagoric monsters in dark projection halls by the help of the first reflectors, and German expressionist film – and focus on contemporary media. Today, Plato’s cave is not only an excellent allegory for film projection, the persuasiveness of which consists of the constant evasiveness of the truth, as well as the creation of fiction and lies, but has also encouraged a number of spatial installations where illuminated objects cast shadows which the spectators are convinced belong to other objects (figs. 15, 16). Rimele also likes to stress that his installations require, in the existential and psychological sense, “the spectators’ effort to familiarize themselves with something which offers relatively little. Additionally, that what it offers is in the form of information which is mobile and changing. The creation or the changing of ima­ges evokes in the observer a feeling of uneasiness which is connected to intangibility. Everything is in front of us, in the form of matter and within reach, and yet the eyes search for support in order to be able to see.” It is to be expected that the visitors of Rimele’s expositions first hurry towards the objects in order to discover a bulb or other source of illumination. At this point, the Freudian uncanny of the observer becomes the artist’s enjoyment. Plato believed that the art of painting was the imitation of the appearance of the objects which are accessible to the senses – imitation only of superficial impressions and not of reality, which is why the created things are only imagi­nary, an illusion. They are the deception of the senses, not far from a magic trick: “Such human experience is the basis for the painting of shaded images, which is in no sense lagging behind magic, conjuration and many other similar tricks.”7 This belief had a fatal influence on the development of the European art. 7 Plato, The Republic, 10, 602d. When Rimele sets a trap for the observer’s curiosity and uncertainty, the creative impulses conditioning his installations do not differ much from anecdotes of the mythical master Zeuxis, who painted grapes so authentically that birds started to fly towards them in order to eat them. But his rival Parrhasios defeated him: he painted a curtain so convincingly that Zeuxis ordered it to be drawn open. When he realized his mistake, he was honest enough to admit that, while he was able to fool only an animal, Parrhasios succeeded in fooling a man, even an artist.8 Rimele’s installations also cause the observers’ movement, similar to a si­tuation described by Filarete between the years 1461 and 1464 in his Treatise on Architecture: The young Giotto was working as an apprentice in Cimabue’s studio, where he carefully painted a fly on the nose of one of the master’s unfinished figures. The next day the master, before continuing his work, tried to chase the fly away with a cloth. Only then did the master realize his mistake.9 The motionless image forced Giotto’s master to come closer and wave his hand towards the cause of the illusion which upset him, for he did not recognize it as an image. Rimele’s observers move in a similar way when they search unsuccessfully for an active source of light, for this light is only a passive reflection. 8 Pliny, Natural history, XXXV, 65. 9 Ernst Kris, Otto Kurz, Die Legende vom Künstler, Ein geschichtlicher Versuch, Frankfurt am Main 1980, p. 92. 10 Leon Battista Alberti, Della pittura, 2, 46–47. 11 Ernst H. Gombrich, Shadows. The depiction of cast shadows in Western art, London 1995, p. 19; Victor I. Stoichita, A short history of the shadow, London 1997, pp. 62–66. 12 Fernando Marías, Skiagraphía: las sombras del pincel, in: La sombra, Museo Thyssen-Bornemisza, Fundación Caja, Madrid 2009 [exhb. catalogue. ], pp. 16–29. 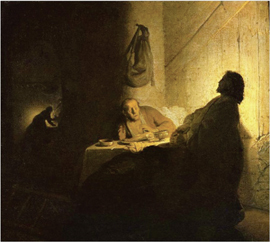 Of course, artists could not always avoid the shadow, particularly not in the cases when it was mentioned in the Bible. 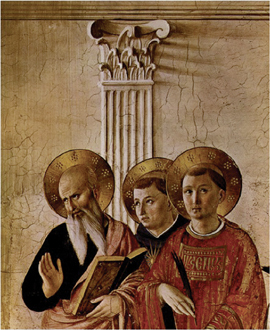 Among the most mo­numental paintings is Masaccio’s representation of Saint Peter from the 1420s. Saint Peter’s shadow had miraculous powers and he used these powers to heal sick people (Acts 5:15). Even more mysterious, and thus left to the creator’s imagination or the imagination of the person who ordered the painting, is the central and incontestable truth of Christianity, which is written down in the gospels. When the angel Gabriel comes to Mary in Nazareth and lets her know that she will give birth to God’s son, whom she should name Jesus, she asks him in astonishment: “How will this be, since I am a virgin?” To this the angel replies: “The Holy Spirit will come upon you, and the power of the Most High will overshadow you; therefore the child to be born will be called holy—the Son of God” (Luke 1:31-35). The very origin of Christianity, the incarnation of the holy son in a human womb, thus happens by overshadowing. The word overshadowing was understood by the Renaissance Neo-Platonists as resembling artistic creation: in Mary’s womb, God shall sketch and contrive the image of his shadow, Christ. That is also how it was explained by the contemporary apocrypha. When Mary heard the angel’s greeting, Jesus entered into her through her left ear like a shadow. In the 13th century, Jacobus de Voragine explained in his best seller the Golden Legend that the Holy Spirit would overshadow Mary so that she would not feel any physical desire. The holy son would be hidden in the shadow in order to conceal his divine light, and in that very shadow he would be simultaneously recognized as a son of man. 13 Victor I. Stoichita, A short history of the shadow, London 1997, pp. 67–71. 14 Geroges Didi-Huberman, Fra Angelico. Dissem­blan­ce et figuration, Paris 1995, p. 50. 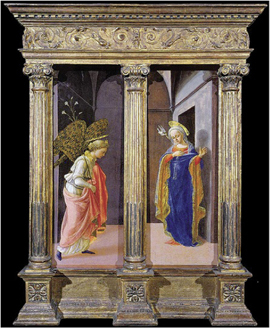 If we come back to the reproduction of Lippi’s Annunciation, we can notice that the photo­grapher has illuminated it from both the left and right sides in the same way it was probably illuminated through windows on both sides as well as by candles in the altar niche of the private place for which it was created. Thus the whole frame construction cast coloured sha­dows of the gilded middle pillar on the scene from both sides. We can assume that by intensive contemplation of the whole altar, the two shadows reminded the believers of the double nature of Christ and his actual presence, and the golden reflection reminded them of his divinity. The altar, with its plastically emphasised frame projecting the illumination of the exterior of the field onto the painting field, is perhaps the best example of Derrida’s parergon.15 When we look at the painting, the frame seems to be part of the wall on which it is fixed, but when we look at the wall, it seems to be part of the painting, its surface merging with the surface of the frame (here Derrida refers to Kant’s goldene Rahmen). The borders of the inside and the outside become erased; the materiality does not divide the parergon only from the inside, but also from the outside, from the wall by which the altar is placed, and gradually from all external (historical, econo­mic, political, etc.) context. That is why we need to understand a work of art and respond to it in such a way that the perception of its interior is formed with what we learn from the exteriority of the field. As regards Rimele’s work, this refers to the human understanding and perception of light and darkness which are discussed in this book. 15 Addition from the exteriority to the central product (ergon), which is neither outside nor inside it, for it cooperates with it from the inside as well as from the outside, “without being part of it and at the same time not completely outside it,” Jacques Derrida, La vérité en peinture, Paris 1978, pp.19–168. Rimele’s consistent interest in the shadow adds numerous other symbolic and narrative values to his installations. The ancient mythological story about the origin of the art of painting, which is said to be the drawing of the silhouette of the shadow of a beloved person’s contours, had later many varieties and interpretations. They all focused on the fact that love or perhaps desire encouraged the depiction of the silhouette of the departing person in order to preserve his eternal presence, not only when he would no longer be there, but also when he would no longer be alive.16 That is why it is no wonder that, aside from the red shadows which are cast by Rimele’s images, Marjeta Ciglenečki also draws attention to the colour symbolism of the “unbridled passion and sacrifice, for red is the colour of initiation. It has the value of sacrament /…/ The red shadow on the wall united the left and the right parts of diptychs into indivisible wholes, but it was also a kind of passionate red slit, which suggested the dematerialisation of the wall and the possibility of the penetration of our gaze”17 (fig. 19). 16 Jean-Claude Lebensztein, L’art de la tache. Introduction à la ‘Nouvelle méthode d’Alexander Cozens, Paris 1990. pp. 285–286. 17 Marjeta Ciglenečki, Odkrivanje sorodnosti in razlik, Ve~er, 246, 24. 10. 2002, p. 11. Let us dwell a little longer on the shape of the diptych, which has a symbolic value in history, particularly in the case of wing altars, where the closed folding wings create tension before opening, before the festive, sacramental luxury of the interior is revealed to our eyes. Rimele says about his own diptychs that they are the “edge of the encounter between the full and the empty, the past and the future, which point to the present as the consequence of both.” That is why they resemble Gothic sculptures of the Shrine Madonna. Mariology refers to Jesus’s mother as the “Vierge ouvrante”, and when her wooden “coat” was solemnly opened, her lap, in which God’s son was incarnated, glittered in the blinding splendour of the highest grace (fig. 20). This grace is timeless or above time: the living believers experience the sub gratia present through meditation on Christ’s past suffering, which announced the forthcoming redemption. 18 Michael Baxandall, Shadows and Enlightenment, New Haven-London 1995, p. 36. 19 Here are some more titles of the chapters: That no reflected colour is simple, but mixed with the expressions of other colours (162), That reflections are rarely of the colour of the body on which they merge (163), Of the colour of reflections (167), That shadows always need to be congruent with the colour of the body from which they originate (615), Which surface of a body will be most tinged with the colour of the object in front of it (619), On which part of the surface of a body with a shadow the colours of objects mix (620) etc., Leonardo da Vinci, Trattato della pittura, passim. Questions such as what happens to the object’s colour in the shadow and why shadows sometimes seem coloured were of great inte­rest to empiricists in the age of the Rococo and the Enlightenment. Georges-Louis Leclerc, Count of Buffon, said about that: “In the summer 1743, I observed more than thirty occurrences of dawn and the same number of sunsets, the rays of which fell upon white surfaces such as white walls; sometimes they were green, but most of the time they were as blue as the most beautiful azure. I showed this phenomenon to some people who were equally surprised as I.” Diderot tried to explain this phenomenon in 1766: “Also shadows have their colours. Look carefully at the edges and at the whole mass of a white object and you will discover an infinite number of intermediary black and white dots. The shadow of a red object is slightly reddish; it seems as if the light which falls upon purple crumbles off some part of it and takes it away.”20 In artistic practice, experiments with coloured shadows were ra­rer. It was not until Impressionism that painters, with the help of the new findings in physics and particularly in optics, understood and depicted scenes in which the shadow takes over the colour of the foundation as it merges with the shadow of the object casting the shadow (fig. 21). 20 Michael Baxandall, Shadows and Enlightenment, New Haven-London 1995, pp. 78-115. Here we can only conclude that Rimele’s painted objects become catchers of the observer’s gaze, which the author has not tricked with the illusion of the trompe-l’oeil or the perspectivistic spatial repoussoirs but only through artistic, light and colour elements. He laid an original trap for the perception process by redefining the image, eliminating all factors which do not belong to the fine arts and thus refining the auto-referential image-creating elements. These function as an atavistic or totemistic spell that overwhelms, enchants and fascinates the observer. With the help of concrete painted objects, Rimele has created the impression of light, tamed its glow and captured all its physical and spiritual dimensions. The illumination of the material object or a concrete place by light has always been the best instrument for meditation, contemplation, and immersion into one’s own spirituality, which can only lead to enlightenment in this way. Today, in the time of different methods of wasting of light, intimate places such as those created by Rimele are rare, and thus all the more precious. That is why we fully believe him when he says that light is the allegory of the revelation of the idea, and is therefore ne­cessary for the revelation of the image. On its surface we see only a small part of reality, but with the reduction of the surface of the world perceived by senses we enter into communication with the internal and the hidden. Leonardo writes about the Moon that “it is not particularly bright in the sky during the day, but during the night it shines so strongly that it chases away darkness and seems like the Sun during the day”.21 That is why for a long time many believed it to be more important than the Sun: the Sun shines during the day, when it is bright anyway, yet the Moon illuminates the night when it is dark. If shadow is the proof of the material existence of an object, the Moon, illuminated by the Sun’s light, is the night evidence of the existence of the Sun. Even when the Sun is invisible during the night, the Moon comforts us with its shine, which in fact is the Sun’s reflection (fig. 22). And such is the case with Rimele’s installations; they show us that shadows and reflections are sometimes more important than light itself. 21 Leonardo da Vinci, Trattato della pittura, 615. Jure Mikuž was born in 1949 in Ljubljana. He graduated in art history and history from the University of Ljubljana, where he also completed his Master and PhD studies. He worked as a curator in the Museum of Modern Art (Moderna galerija) in Ljubljana, and was also its director between 1986 and 1992. Since 1996, he has been professor and head of the Historical anthropology study programme at the Institutum studiorum humanitatis – Graduate school of the humanities in Ljubljana. Since 2010, he has also taught theoretical subjects at the Academy of Fine Arts and Design in Ljubljana. His bibliography consists of 800 scholarly publications, including twenty books.